More than just a holiday rental. 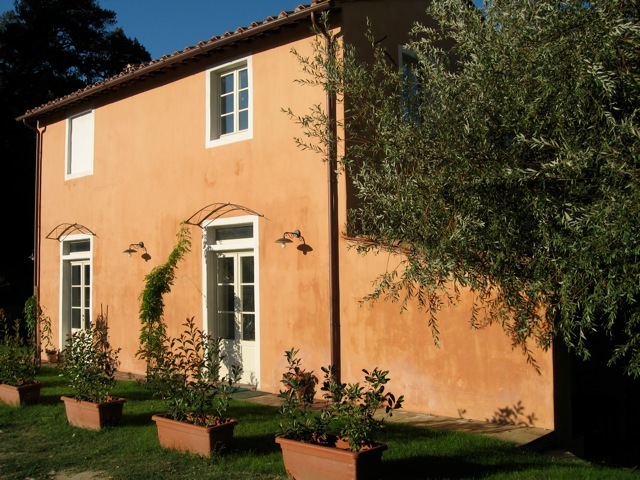 It lies in the hills with stunning views over the valley and woodland towards Lucca. The properties have been lovingly restored to a high standard using original materials including cotto floors, chestnut beamed ceilings, and local marble. A Chele is on 3 floors and includes 7 bedrooms all ensuite. The infinity swimming pool is integrated into the terraced vineyards. The south-facing loggia and patio provide beautiful views along the valley. The picturesque lodge, Il Granaio, lies within the estate sleeping 6 people in 3 king size double bedrooms. A Chele can sleep up to 16 people, with a further 6 in the lodge, Il Granaio. The house is on 3 floors. There are 7 luxurious double/twin king size bedrooms, all en-suite marble and terracotta floored bathrooms (3 with separate bath and shower). The 3 spacious relaxing lounge rooms are on two floors. The extremely well appointed farmhouse style kitchen with a demonstration central unit and has two ovens, a fridge and a freezer. There are also 2 store rooms and a laundry. The spacious dining room can seat up to 16 people for formal or informal eating. The ground floor comprises a large lounge and dining area, with a well equiped kitchen in painted wood and marble surfaces. There is also a laundry room and wc. The central stairs lead to the first floor with 3 large king size bedrooms. One bedroom is ensuite with bath, separate shower and twin basins. There is another bathroom on the first floor. The bathrooms have been decorated similarly to A Chele with coloured stucco walls and tasteful lighting and chestnut beams, terracotta tiled floors, carrara marble surfaces, shower walls and floors with high quality bathroom fittings. The beautiful infinity pool is set in the private south facing terraces of the estate surrounded by colourful borders and banks. There are dramatic views to the east of the plain of Lucca and to the west the hilltop village of Fibbiala in the distance. The houses are set in our spectacular estate of woodland, olive groves, fruit trees and vines. A stream flows through the estate inviting adventurous walkers to follow its course into the woods between the terraces. There is an abundance of wildlife from porcupine to orchid and the firefly performance in May is spectacular. Located close to the villages of San Macario in Monte and San Macario in Piano with a local village store, baker and butcher 2km. The nearest supermarket is 6km away. Easy direct route to the historic walled city of Lucca, a distance of only 10km. The Versilian Coast with its long sweeping beaches is a distance of 20km. The Puccini festival is held in July and August at Torre del Lago a distance of 20km. Florence is a 45 minute drive. In winter, skiing is 1 hour drive away at Abetone and Mt Cimone. There are a number of spectacular golf courses in the vicinity.